Actually there is another scheduler with fairness guarantees and low latency: BFQ (http://algo.ing.unimo.it/people/paolo/disk_sched/). It also supports cgroups interface. It is not in mainline kernel though, but it has been developed for quite a while (I was using it when on zen kernel and while maintaining my own). From what I remember, it is also on few android ROMs. But, speaking of mainline itself, the multiqueue block layer: https://lwn.net/Articles/552904/ should be interesting (especially for SSDs). Regarding maintaining journal on separate device, it may not work that well since something like barrier gets disabled there, and the co-ordination between two devices becomes a problem: http://xfs.org/index.php/XFS_FAQ#Using_an_external_log. Yeah, we’re working on block-mq internally (Jens Axboe is now with us, yayyyy). Regarding separate journal, I think you’re somewhat misguided here. 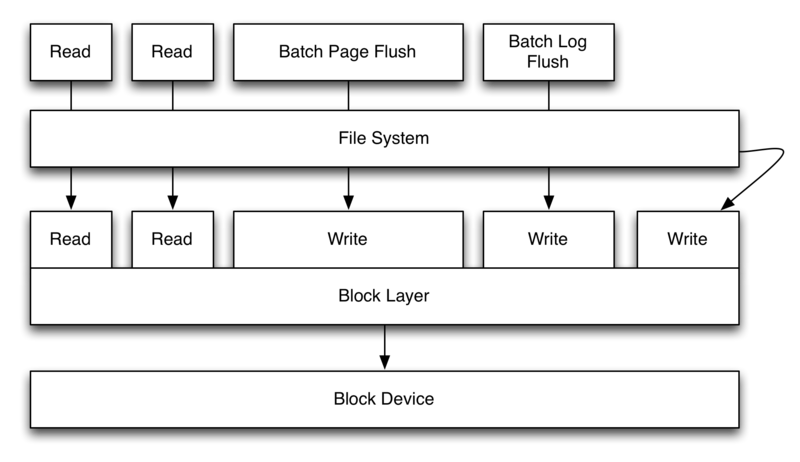 Most of database engines have been written with “logs sit on separate devices” concept, and there’s nothing that truly prohibits you from using it that way (that is, synchronization between data volume and journal is still maintained through checkpoints). One rarely cares about write barriers when underlying storage has persistent caches – so nobody really issues true barriers for anything, and “what I fsynced is what persisted” is truly expected from storage devices.